A rugged, low cost, non-contact position and dimension monitor that is easy to use for manufacturing and process control operations. Self-contained unit is ready to operate. High-brightness LED display is easy to read under normal room lighting even from a distance. The internal keypad allows versatile programming of the many parameters and the three alarm outputs allowing maximum flexibility of interface. Video and Sync outputs signals for oscilloscope readout are standard. Resolution and linearity are determined by fixed spacing of diodes in the 5000 element linear CCD array. Resolution to 1/5000 of full-scale range is achievable through optimization of optics. For example; full scale range of 1.000" gives a resolution of .0002"
Measure moving objects without creating friction, mechanical loading or distortion. 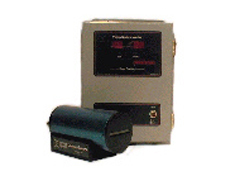 Measure objects in hostile environments such as hot, cold, vacuum, high voltage, etc. without contact or contaminating the object.